My little corner in cyberspace to share my passion of rubber stamping and scrapbooking with you. ENJOY!!! Welcome to my blog!!! I'm super excited to share my passion of rubber stamping with you...YES, I'm a Stampin' Up! Demonstrator and LOVING it! Sit back and stay a while...I'm really glad you stopped by and I hope you enjoy your visit! Like what you see?.....Shop 24/7 in my online store for all your stampin' wants/needs today!!!!! Check Out My Classes & Schedule Your Workshop Today!!! I'd love to be your Stampin' Up! Demo....visit my online store today!!! My Awesome Followers!!! Love you all & thanks for following me!!!!! T Stands For VSN Totally Done! I do not have anything new that I made to show so I'm featuring a few of the 3D swaps I received @ our downline meeting last Monday. Isn't that bunny basket cute? That one is my fave out of the bunch but I think they're all fabulous!! Our 3D swaps usually are....I'm sooo happy to be a part of the Dauber Divas!!! Well, I need to go grocery shopping and quite possibly start cleaning the yard off. Fun, fun right...NOT!!! I better get moving before the kiddos start complaining about the shortage of food in the house LOL! Thanks so much for stopping by and have a great rest of the day!!! What a nice bunch of goodies! I second your feeling on the bunny basket. Looks like it's made from punches! They're all beautiful things. Thanks for sharing. What great projects, very very cute! Wow, such awesome goodies! That bunny basket IS cute, and I love that blue pizza box, too. Those kids - LOL - so demanding wanting food every day! Mine does the same thing - and wants food at least 3 times a day. *sheesh* LOL Gotta love 'em though - they sure do make life worthwhile! Have a wonderful day and enjoy being outside! These are all neat projects, but I agree, the bunny basket is too too cute. These are all adorable, Jackie....love the bunny one with the big brown eyes....soooo cute!!! Those are fantastic! I love them all and can see why you had a tough time choosing but can also see why you chose the bunny!! Fun stuff!! TFS! 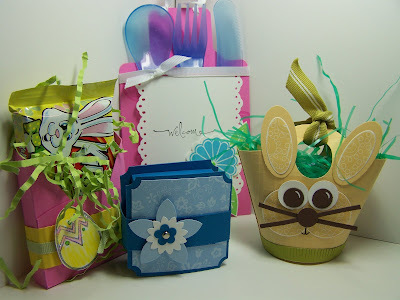 The bunny basket is my favorite from the swap. Do you happen to have directions you could share? OMG!! These are too cute!! :) I really love that bunny basket!! How sweet!!! These are so cute Jackie!! What a fun idea!! Thank you for visiting my blog today! I'm so very pleased that you enjoy my creations & leave wonderful comments! I appreciate each & every one of them....they totally make my day!!!! Don't forget to become a follower & I look forward to your visit again soon!!!!! Some stamped images are © 2019 Stampin' Up! All content (including text, artwork & photographs) is © 2019 Jacquel L. Bowman unless noted otherwise. Original artworks are shared for your personal inspiration and enjoyment only and may not be used for publication or design contest. Thank you so much for your support and respecting my wishes!! Visit Jacquel's profile on Pinterest. My Work Was Featured 2014!!!!! DT Top 5 Pick 2014!!!! #1 Top 3 Pick 2014!!!!! First Pick in Top 3 2013!!! I Craft When I Can!! !